where an extra fine and smooth animal glue is required. 4 1/4 in. 1.5 in. 8 1/2 in. 1.75 in. 18 1 in. 2.25 in. and seamless metal ferrules. For all hot or cold glue applications. 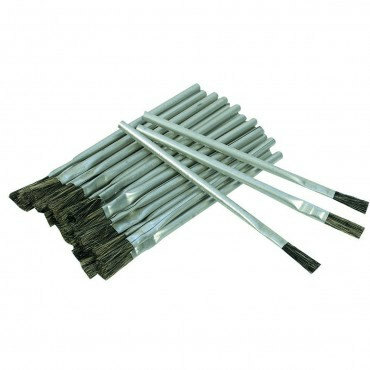 Wire bridled construction for added strength and to extend the brushes life. 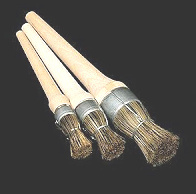 When the brush wears down, remove the bridle, you now have a 'new' glue brush! Use original Hot Stuff (RED Label) when the pieces you're gluing fit well. With a consistency close to water, it bonds in as little as 5 seconds! leather, rubber and metal, and many plastics. For parts that don't fit perfectly use Super T (Yellow Label). It's thicker, takes a bit longer (25 seconds) to cure, and has the ability to fill small gaps between bonding surfaces. a slow cure (60 seconds) will allow for re-aligning of parts after you put them together. prepare /clean the surface with NCF Accelerator as directed. after you place them together. to allow for re-aligning of parts after you put them together. For pitchy, oily, or hard to bond surfaces, prepare /clean the surface with NCF Accelerator as directed. 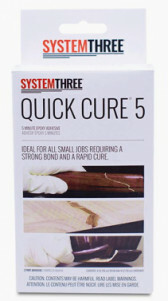 to cure, and has the ability to fill small gaps between bonding surfaces. to cure when it wouldn't otherwise. 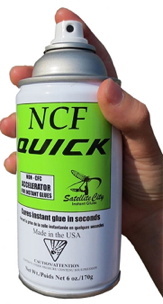 NCF Quick is less expensive per ounce, has a more pleasant odor than the others, and comes in a 6oz aerosol can for easy application. at once if you are making multiple bonds. If you get the part wet, you are applying too much. NCF Quick is plastic-safe and foam-friendly. 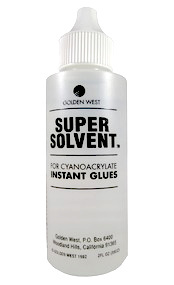 Hot Stuff SUPER SOLVENT for Cyanoacrylate Glues, 2 oz. to de-bond your fingers (if or when they get stuck). ALWAYS Use Eye Protection ! 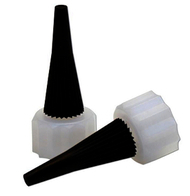 Replacement TIPS with CAPS for clogged or damaged tips. Tips Fit 2oz & 4 oz bottles. 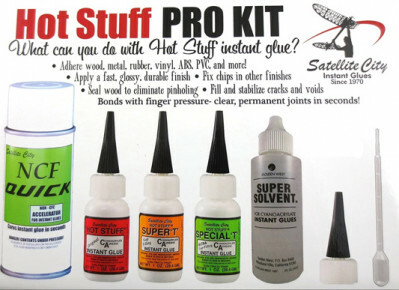 Hot Stuff (Red Label) & Super T (Yellow Label) Glues. 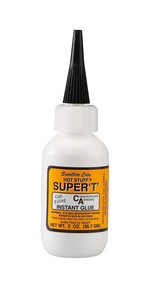 Hot Stuff Original thin CA glue and Super T medium gap-filling CA glue. the opening is large enough to slip the Pro Tip through from the inside. so if it clogs and you have to cut it down, it will still apply the glue just as precisely. Use epoxy adhesive when strong, fast bonds are required on wood, most metals, fiberglass, ceramics, concrete, glass, leather and many plastics. Whether you are making a structural repair to furniture, creating craft items where durability is important, this two part epoxy is the answer. 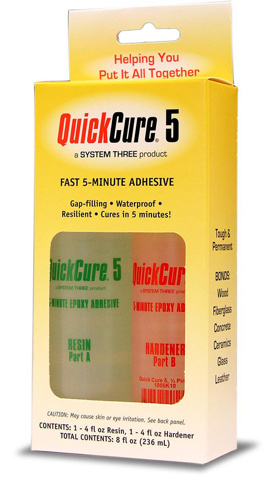 Quick and easy, and one of strongest glues available. to make a custom matched or contrasting filler for voids or missing knots. Note: New WHITE BOX Packaging is replacing the older bright yellow pack. concrete, glass, leather and many plastics. 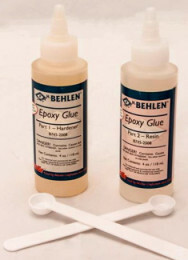 this two part epoxy is an excellent choice. clear drying, gap filling, resilient, and extremely water resistant. For onsite service and repairs the 50ml (1.6 Oz.) Syringe automatically dispenses equal parts resin and hardener with a push of the plunger. 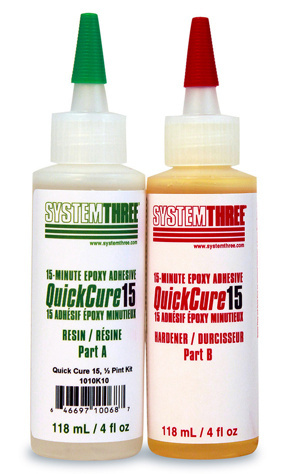 NOTE: For a little more assembly, positioning & clamping time we recommend the QuickCure-15. and is endorsed by leading designers, builders. Use 3 oz of hide glue per 1 square foot of glass to be chipped. A one pound pack (16 ounces) covers approximately 5 sq ft.